【Application】 frequently used for precious metal deposits (like gold) and gemstones. 【Description】 Gold Sluice Box is a kind of mineral gravity separation equipment, mainly used for the selection of sand gold ore and alluvial gold recovery, definitely an important gold panning equipment. 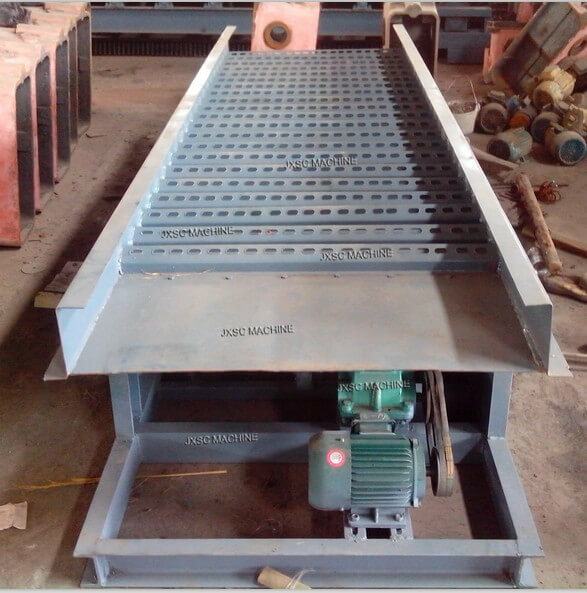 Vibrating sluice box can effectively overcome the phenomenon of slotting, reduce the silting and improve the gold recovery rate of fine-grained gold. Based on the difference of the gravity of gold and sand, the slurry flows through the gold sluice, the gold with high specific gravity is deposited at the gold mining sluice box bottom, and the sand with low specific gravity is floated at the top and drained out of the working area with the water flow. 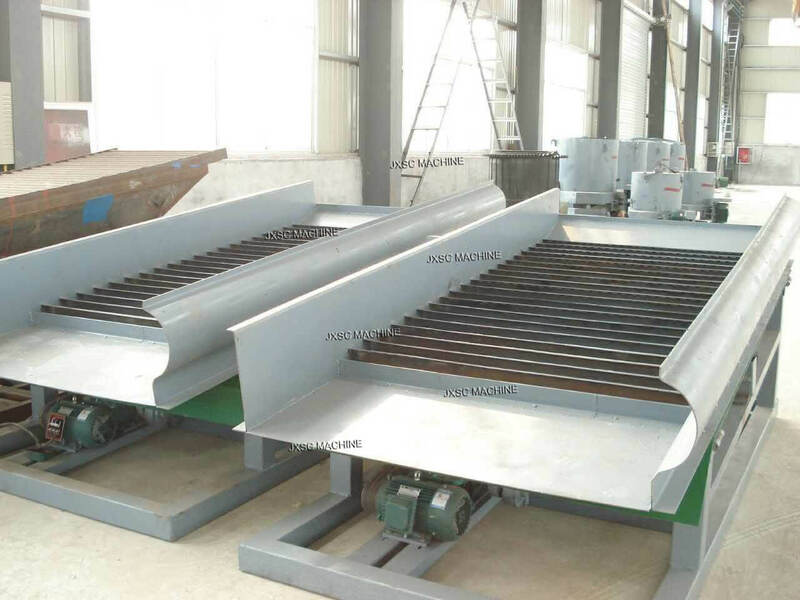 After many years of improvement and comparative tests, the gold sluice box has become the first choice in gold mining machinery because of its simple structure, reliable operation and high clean-rate. JXSC high production sluice box is the new type of gold equipment, combine with other gold mining tools and equipment( crusher plant, ore washing plant) to achieve great production efficiency. Sluice box for sale! 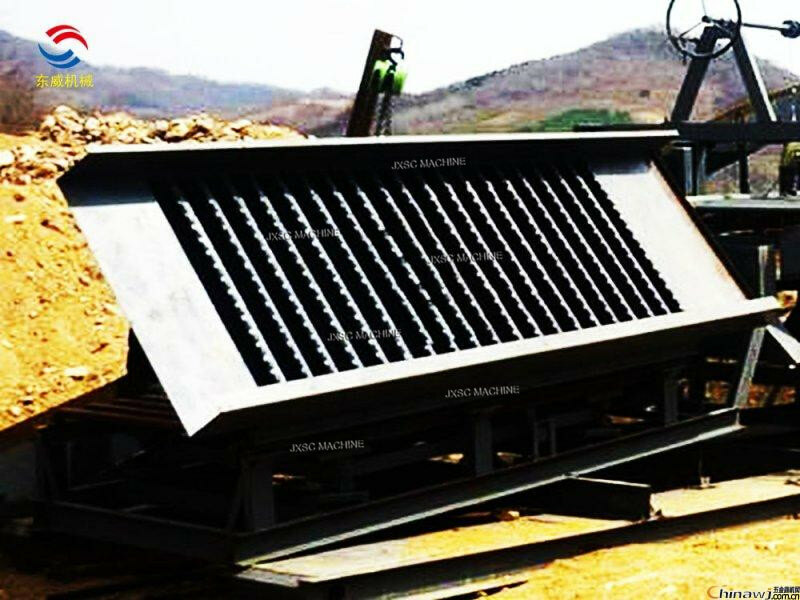 JXSC manufactures gold panning equipment over 30years, supply various of gold equipment includes sluice mining, portable sluice box and small scale gold mining equipment/ mini sluice box are is customized available. 【Gold Sluice Box Working principle】: We have developed a new kind of vibration sluice box, which includes a base and a sluice box. One side of the gold sluice box is hinged on the base, and a supporting rod is arranged on the side away from the base where the sluice is hinged. The base is rectangular and the four corners of the base are provided with supporting legs A telescopic sleeve is arranged at the upper end of the supporting leg and is fixed on the base. A handle controlling the lifting of the telescopic sleeve is arranged on the supporting leg, and a vibrating motor is arranged at the bottom of the gold sluice box. The telescopic sleeve installed at the upper end of the supporting leg can drive the base and the sluice box to change the angle according to the current, thus making the recovery efficiency better. Gold sluice box has been in continuous use for over 100 years! A sluice box is one of the oldest and most productive methods of gold prospecting. Sometimes people also call it -- high banker, felt, cohesive gold blanket, sluice mat, sluice carpet, gold grass mat, gold rush etc. Our sluice mat/ carpet is manufactured by Japan technology, with very good quality and also with an extremely high recovery effect than the traditional mat. Provide a high economic benefit for the user.